Howard S. Becker is a leading contemporary sociologist who interprets society as collective action and sociology, therefore, as the study of collective action. This volume explores the theory and methods necessary to study collective action and social interaction. Becker includes most of his work on theory and method that has not previously appeared in book form. It reflects his unique way of thinking about and studying society. 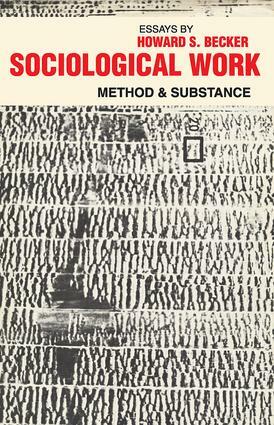 The first part of the book treats methodological problems as problems of social interaction and lists a series of research problems requiring analytic attention. The second part illustrates Becker's approach through full reports on two of his major research projects. Four theoretical statements on how people change comprise the third part, and the fourth part includes important contributions to the study of deviance. These essays illustrate the need to study deviance as part of the general study of society, not as an isolated specialty. Sociological Work is an important statement of the distinctive theoretical and methodological views associated with the Chicago School of Sociology; it shows a deep concern with the first-hand study of processes and human consequences of collective action and interaction. This illuminating volume is an engaging introduction to some of the issues of importance to sociologists and those interested in the studies of collective action and deviance, and it is well adapted to use in courses in these areas. 8 Whose Side Are We On?